Depression is the most frequently observed psychiatric disorder in HD, with an estimated prevalence of 40% to 50%. Depression is the most frequently observed psychiatric disorder in HD, with an estimated prevalence of 40% to 50%.3 Other common psychiatric symptoms or disorders in this population include apathy (52% to 76%), anxiety (17% to 61%), irritability (35% to 73%), and obsessive and compulsive symptoms (7% to 50%). Psychotic symptoms, such as paranoia and delusional states, affect an estimated 3% to 11% of patients with HD, and sexual dysfunction and suicidal ideation are additional symptoms that are elevated in those with HD compared with the general population. Neurology Advisor further discussed the topic with Alexandra Nelson, MD, PhD, assistant professor of neurology at the University of California, San Francisco, and the Richard and Shirley Cahill Endowed Chair in Parkinson’s Disease Research there, and with Veronica E. Santini, MD, MA, clinical assistant professor of neurology and neurological sciences at the Stanford University School of Medicine, and director of the Stanford Multidisciplinary Huntington’s Disease and Ataxia Clinic, an HD Society of America Center of Excellence. Neurology Advisor: What are some of the common neuropsychiatric symptoms in HD? Dr Nelson: HD symptoms mostly fall into 3 groups: mood/behavioral symptoms, cognitive symptoms, and movement symptoms such as chorea, dystonia, and loss of coordination. Under the mood/behavioral category, symptoms include depression, irritability, apathy, impulsivity, and — in a smaller fraction of patients — psychosis, obsessive/compulsive behavior, and anxiety. Behavioral symptoms can occur very early during the disease (up to 10 to 15 years before the emergence of movement symptoms in some cases), and earliest symptoms are often irritability and/or depression. In the cognitive category, early symptoms include loss of ability to multitask, stay organized, plan ahead, and stay focused on a task. Later in the disease course, patients can have trouble with memory (remembering things they have heard or read, or where things are) and with language (finding the right words and putting thoughts into words). Dr Santini: There is a high prevalence of depression in HD, which when coupled with impulsivity and other behavioral symptoms contributes to a suicide rate that is 4 to 6 times higher than that of the general population.5 In fact, suicide is a leading cause of death in HD, and risk factors for suicide in this population include social isolation, family history of suicide, declining physical health, loss of physical independence, and loss of employment. Apathy, although not particularly bothersome to patients themselves, can be a significant barrier to treatment and healthy lifestyle or behavioral modifications. In fact, apathy is present early and scores significantly increase from premanifest to early stage HD. Neurology Advisor: What are the underlying mechanisms associated with these symptoms? Dr Santini: The underlying pathophysiology of the neuropsychiatric features of HD is incompletely understood, and it is likely that environmental and epigenetic factors play a role in the phenotype variation exhibited. Early in the disease course, imaging and neuropathologic studies have implicated the striatum, specifically the dorsomedial caudate and dorsal putamen. Some authors have theorized disruption of limbic circuits — particularly the lateral orbitofrontal and anterior cingulate — as a cause of psychiatric features in HD. Since this contrasts with former studies that have demonstrated less involvement of limbic (ventral) striatum in early disease, a theory of the open interconnected model of striatothalamocortical circuitry may offer more insight. On a neurotransmitter level, altered receptor expression and binding of serotonin, dopamine, and enkephalin have been linked with neuropsychiatric symptoms. Neurology Advisor: What are the challenges of treating neuropsychiatric symptoms in this population, and how can clinicians best address these? Dr Nelson: Treating mood/behavioral symptoms of HD can be among the most gratifying parts of providing HD care. These symptoms are often the main source of frustration for both patients and families and can cause a lot of problems in everyday life. Irritability and impulsivity can cause arguments and poor decision making, driving conflict with loved ones and colleagues or supervisors at work. Often patients and families are not even aware that these symptoms are related to HD, and sometimes patients blame themselves for these symptoms, causing further problems. However, these symptoms, especially irritability, depression, psychosis, and anxiety, are quite treatable with a combination of medications, talk therapy, and often changes in other habits and routines. I think the major challenge as a clinician is to educate families and the community to be on the lookout for these symptoms, since they are usually the earliest symptoms but are also eminently treatable. Dr Santini: Optimization of therapy for [people with] HD should include a multidisciplinary approach addressing the motor, cognitive, and neuropsychiatric or behavioral symptoms of the disease over time. Members of the care team can include primary care physicians, neurologists, psychiatrists, genetic counselors, social workers, therapists, and rehabilitation specialists such as physical, occupational, and speech therapists. Even in the absence of a dedicated HD multidisciplinary care setting, increased communication of the individualized team members will enhance patient care and offer increased support to families and caregivers. In some circumstances, the use of pharmacologic agents is necessary, particularly in the treatment of depression, anxiety, psychosis, obsessive compulsiveness, aggression, or impulsivity. Despite being widely used for these symptoms, there is no evidence for the use of selective serotonin reuptake inhibitors or other traditional antidepressants. There is, likewise, no evidence and also little anecdotal support for the use of pharmacologic agents to treat apathy, while sedating medications can potentiate this symptom, further hindering treatment. It is also important to consider the potential effect of medications that are used to treat chorea or parkinsonism on the neuropsychiatric features, possibly contributing to increased rates of depression, suicidality, or psychosis. Finally, cognitive and behavioral changes (including apathy) may be significant barriers to patient compliance with pharmacologic or environmental therapies. Neurology Advisor: What should be the focus of future research in this area? Dr Nelson: There is increasing awareness of the mood/behavioral symptoms of HD in the community, but I think many research studies still use movement symptoms as the major measure of disease progression and as a yardstick when we perform clinical trials. It will be important to find the best ways of measuring mood/behavioral symptoms early in the disease and to begin using these in our search for the most effective way to slow disease progression. [Additionally], there have been no large randomized, double-blind studies of specific medications for the treatment of mood/behavioral symptoms. Clinicians use evidence gathered in other diseases to guess which medicines might be most effective, and medicines [approved by the US Food and Drug Administration] for depression, mania, or psychosis are also helpful in HD. However, it would be fantastic if we could choose specific medicines on the basis of studies in patients with HD, who may be more sensitive to certain side effects or get extra benefit from certain agents. This would require large randomized trials of different existing agents used for depression, for example, in patients with HD. Dr Santini: The current landscape of HD research is well purposed to find disease-modifying therapies to slow or stop the progression of HD. Antisense oligonucleotides have shown promising results in reducing central nervous system mutant huntingtin protein by targeting messenger RNA from the huntingtin gene. Moreover, phase 2 studies have found these compounds to be safe and well tolerated. Newer gene editing technologies to remove or silence extended CAG repeats (CRISPR/CAS9) delivered by viral vectors may have the added advantage of targeting only the mutant huntingtin alleles. These therapies have not yet entered clinical trials and therefore inquiries into the delivery of these compounds to the central nervous system, their safety and efficacy profiles, and the timing of their therapeutic introduction remains unanswered. Given the ability to genetically diagnose HD in a presymptomatic stage, parallel studies are searching for the proper biomarkers to determine timing of initiation of these potential disease-modifying therapies. Since the mutant huntingtin protein may have neurodevelopmental effects, many questions remain in this realm. 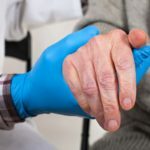 Regardless of the remaining uncertainties of these therapeutic advancements, the current direction of therapeutic research is exciting and encouraging to the HD community, giving the hope of limiting or potentially eradicating this devastating disease with mutigenerational effects. Anderson KE, van Duijn E, Craufurd D, et al. Clinical management of neuropsychiatric symptoms of huntington disease: expert-based consensus guidelines on agitation, anxiety, apathy, psychosis and sleep disorders. J Huntingtons Dis. 2018;7(3):355-366. Goh AM, Wibawa P, Loi SM, Walterfang M, Velakoulis D, Looi JC. Huntington’s disease: neuropsychiatric manifestations of Huntington’s disease. Australas Psychiatry. 2018;26(4):366-375. Paoli RA, Botturi A, Ciammola A, et al. Neuropsychiatric burden in Huntington’s disease.Brain Sci. 2017; 7(6):67. Loi SM, Walterfang M, Velakoulis D, Looi JC. Huntington’s disease: managing neuropsychiatric symptoms in Huntington’s disease. Australas Psychiatry. 2018;26(4):376-380. Paoli RA, Botturi A, Ciammola A, et al. Neuropsychiatric burden in Huntington’s disease.Brain Sci. 2017;7(6):67. Andrews SC, Craufurd D, Durr A, et al. Executive impairment is associated with unawareness of neuropsychiatric symptoms in premanifest and early Huntington’s disease. Neuropsychology. 2018;32(8):958-965.